The first 2 hours I had spent in New Zealand had already made my 30 hours flying worth it. When I woke up on the fourth day, knowing I had a week more just made me happier. 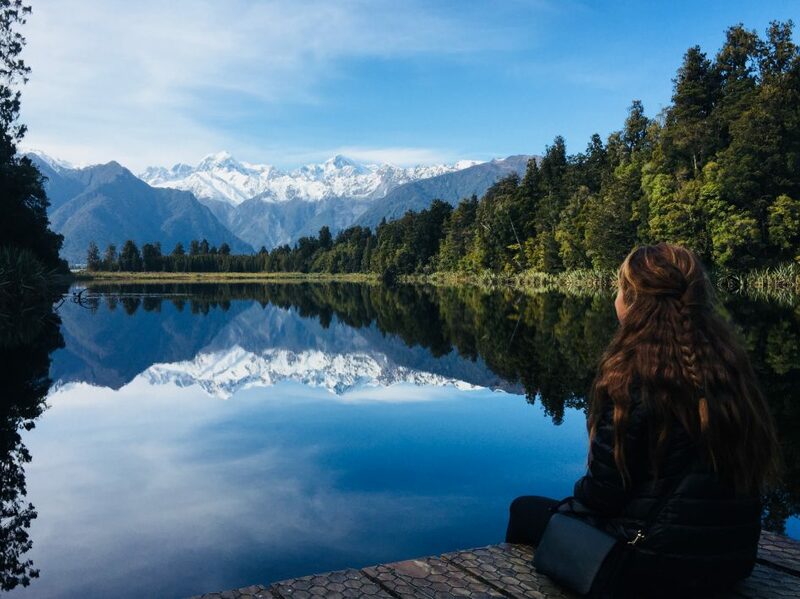 I jumped again into the Stray bus that brought me shortly after to the picture-perfect Lake Matheson. I loved it! It is really like a mirror, incredibly flat. You can walk around it for 1-2 hours. (Something I loved about NZ is the number of walks or hikes you can make potentially everywhere.) I took loads of pictures. The next stop would be Makarora. We stopped for a while there and then we would drive all around it on our way to Wanaka. Needless to say the landscape was astonishing and I took a ridiculous amount of photos. Wanaka was a very pretty town around lake Tokatipu. I walked at sunset to reach a cool spot called lonely tree. 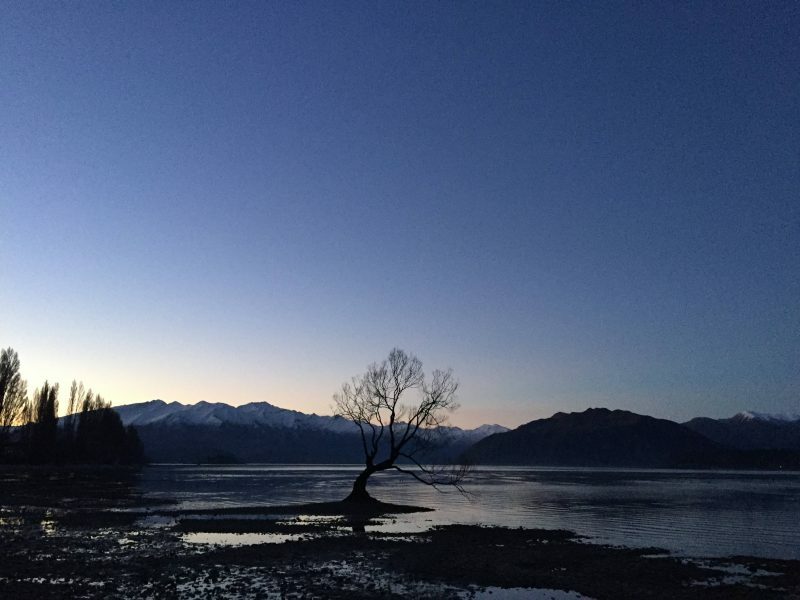 It is a tree in the middle of the sea, made famous by Instagram. It was nice to see but when I checked it it was not in the water, probably due to the low tide. A bit creepy though. After that, I went to the grocery shop and I bought lots of fruits because NZ made me healthy (briefly). For some reason, I was eating fruit and carrots all the time (maybe because I saw all Kiwis doing it). The next morning I rented a mountain bike with a couple of girls more and I made a very scenic 3 hours (that quickly became 4 hours) ride around the lake. At this point, you must have noticed that New Zealand is all about lakes. And mountains reflecting in lakes. So you know already what was the highlight of my next destination as well: a lake! To be precise, the Lake Wakatipu in Queenstown, where I would sleep 3 nights. 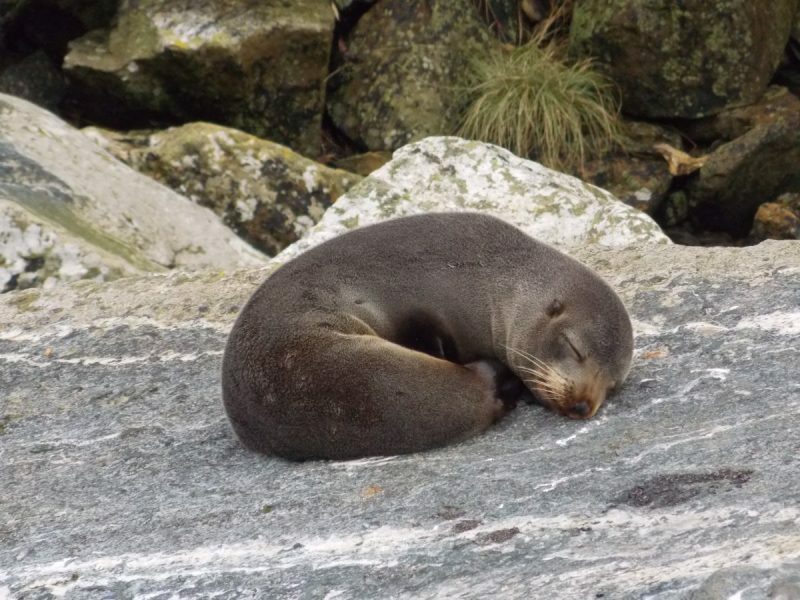 I had a lovely day trip to Milford Sound, where I jumped on a boat, did NOT get seasick and even managed to see seals! Queenstown is a touristy town where you can do tons of winter sports or just enjoy the scenery (and the lake). It is really enchanting. I left on my 4th day as we were going to lake Tekapo. I will not mention the word lake again and I will avoid the words blue, beautiful, mirror, etc. I leave this to your imagination. And I will go directly to Mount Cook. About Mount Cook. When we were going, I thought I had seen already all the magical landscapes of New Zealand. I was just waiting to see another beautiful lake. I thought NZ couldn’t get anything better. Nobody lives in Mt.Cook (or at its base). There is 1 accommodation and a few people that work there. We got there approximately 3 hours before sunset, just on time to go for a walk and come back. The scenery I saw was unreal. Mount Cook was huge and gorgeous. The lake at the sunset had a lovely greenish color. When I was there, the ice on the water just made everything magical. That’s the moment when I decided I would be back to New Zealand soon. 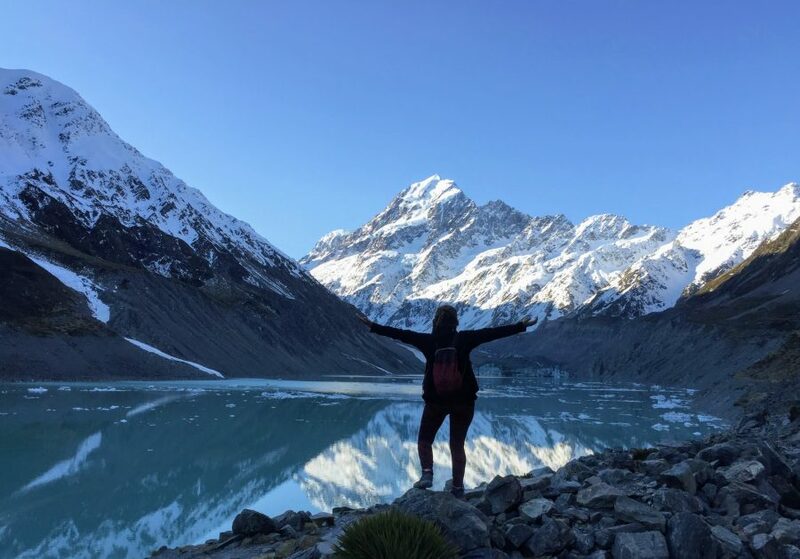 I spent the night at Mt.Cook in total peace and relaxation. The day after we would head back to Christchurch! It was good I only had saved one day for Christchurch. I did not know (or did not remember) than in 2011 an earthquake almost flattened the city and killed nearly 200 people. From that moment, the city has half-destroyed buildings everywhere, it’s silent and sad. Obviously, there is no much to do. I left the day after to go to Melbourne, and at the back of my mind, I was already planning a second trip to NZ… this time to North island! After years of struggle to fit in the corporate world I quit and decided to travel, live wildly and be happy. Here you will find adventures, tips and ideas. Where to go in South America?